Owner. Dishwasher. Maker of Food. 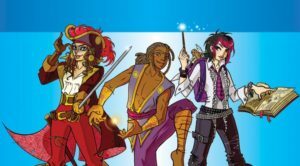 We are a nerdery that celebrates diversity in the geek world. 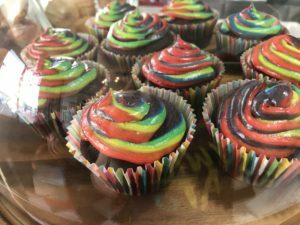 What better way than to make rainbow cream cheese for Hudson’s Pride weekend? I identify as queer (and have done for many years), so there was no question that we’d have rainbows all over the place for the celebration. With the Awesome Bagels that we carry, it was only natural to think about some way of Pride-ifying them! We first started with cupcakes – to test our methodology. And honestly, the cupcakes came out SO WELL that we’ll be continuing to carry them through the rest of June. They may make an appearance further down the line as well! Our food is very simple. Good ingredients with few or no additives, the freshest options possible, and a good dose of attention to detail. 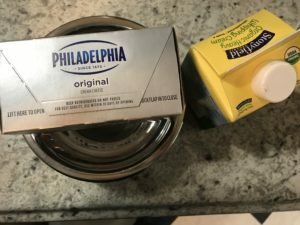 We tested a couple of different cream cheeses, including a highly rated and fairly expensive one, before coming back to the old favorite, Philadelphia. Only five ingredients, a perfectly creamy texture, and the traditional cream cheese flavors that we all expect. To lighten up the cheese a little, we whipped it with a dash of Stonyfield whipping cream (it’s the same one we use in our cupcake frosting). 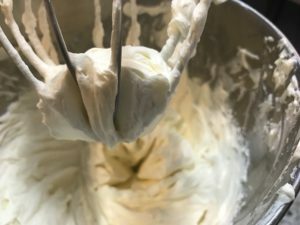 Throw four blocks of the cream cheese in a stand mixer, add 3-4T of cream, and beat it (beat it, beat it, beat it…). Eventually it ends up with this amazingly fluffy texture which is absolutely perfect for tinting. We could have mixed up each of the seven colors of the rainbow, but we found an easier way: mix four colors, then blend them once they were on the bagels. It made for a quicker prep, and didn’t add any time or effort to our final product. We used a gel/paste color – powder would be even better. Anything that doesn’t increase the moisture content will make for a better, brighter, more even color. Please don’t use liquid dye. 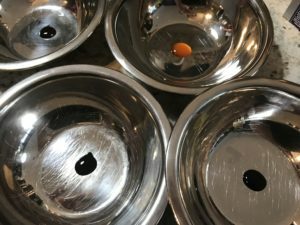 It’s easy to find in supermarkets, yes, but it results in pale, barely-there color as well as changing the texture of the base. In the cafe, we use the AmeriColor gels, which give wonderfully deep colors. 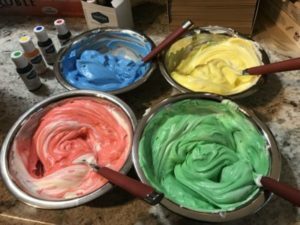 These are professional grade colorants, which are easier to use (and maybe a bit more expensive) than the classic Wilton – but they do require more blending of tints to achieve the goal colors. We found this pack on sale at the King Arthur Flour website. 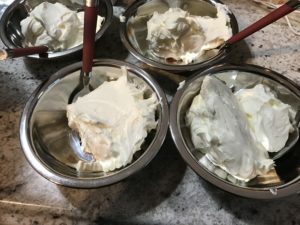 Once the cream cheese is whipped, portion it evenly into bowls. Mix the color in until it’s smooth and even toned – go ahead and add an extra dollop of gel, if you feel the need. Sometimes it takes more than you originally thought, to get the right color. Heck, we kept some of the cream cheese as white, to have the option of diluting if the colors were too brash! Once the colors are mixed, it’s time to bag them up. For the original frosting, we used a classic method of creating multi-color icing. We spooned out each color in parallel lines on a piece of saran wrap, then wrapped it up and dropped it, point-first, into a bag. Clip the corner, and go to town. For the cream cheese, we decided to do it a little differently. We gave each color its own bag, piped them individually onto the bagels, then used a knife to spread and mix the colors to make the rainbow. It gave us quite a bit of control, and meant that we were able to create exactly the colors we needed while skipping a messy (and in this case spurious) step. Our first test came out beautifully – but we knew we could do better. So we created a second bagel, which was a sight to behold! All day, we made rainbow bagels and celebrated an inclusive Pride here in Hudson. It was a bright and shiny weekend, with a colorful parade. We know there’s still a lot of work to be done. Pride can be more inclusive, and the LGBT+ community can become more welcoming. But in the meantime, we can create new flags that are more representative of the various identities within our community, and we can eat rainbow bagels. 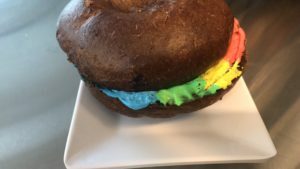 Or pumpernickel bagels with rainbow cream cheese. On the weekend of June 24th, A Friend of the Cafe will be in-house for a couple hours to teach one of our favorite gateway games: Splendor. Stephen Chast will be on hand to instruct, demo, and otherwise teach the rules, strategies, and mechanics of one of the great modern classics. On the heels of the recent announcement that an expansion is to be released, Stephen will show off this simple strategy game in which players fight to build a precious gem collection. 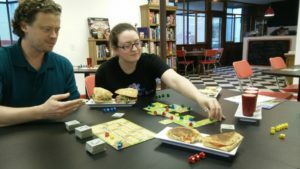 This is the first in a series of weekend events, designed to introduce selections from the cafe library – especially those that are a great introduction or re-introduction to the world of gaming! Carcassonne! One of the modern classics. With straightforward rules and simple expansions, it becomes a gateway for nearly every new gamer. The wealth of strategies keeps most coming back for more. Carcassonne, like last week’s focus, Qwirkle, is a tile-laying game. 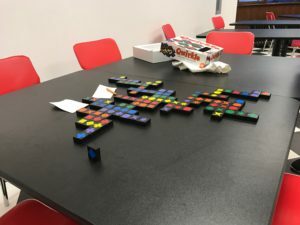 Unlike Qwirkle, there is more to the matching than just color or shape. 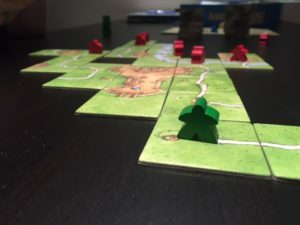 You are literally building the cities, roads, monasteries, and farms surrounding medieval Carcassonne, in southern France, and then laying claim to them by placing meeples. By matching up specific elements on randomly-drawn tiles, you expand your area of influence and gain points: when the tiles run out, the game is over, and points are tallied. The version we have in the cafe also includes both the River and the Abbots & Gardens expansions, which adds an element of complexity to the base game. Both are optional expansions, and we usually recommend leaving them to the side until new gamers are comfortable with the core game. We played it earlier this week with a group of four, but it plays just as well with two or three. 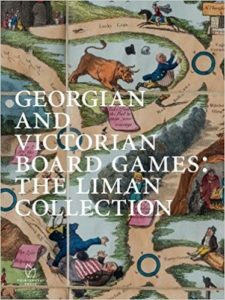 It’s a core part of most game collections because it appeals to most gamers – the small amount of luck in drawing tiles and the moderate amount of strategy in placing the tiles makes for a versatile and ever-changing game. A fun side note: the term “meeple,” used to describe the vaguely human figures seen in many modern games, was first coined to describe the pieces used in Carcassonne. The story is now a bit of gamer lore, but meeples have become a common representation of gaming – we even have one in our logo! Part of that is because it has easy, familiar mechanics, such as those found in Scrabble and Dominos. It’s a tile-laying game, where each tile has only two variables: color and shape. By creating a row of one matching variable on each turn, you create a colorful, textured game board that grows as you play. The rules: Each player draws six tiles from an opaque bag, and sets them up in such a way so as to hide them from the rest of the table. From those six tiles, the player is trying to build a line of either all the same color (different shapes) or all the same shape (different colors). Within a line, only one of the variables is repeated – the other must be all different. Scoring is done after each line is placed, and is the sum of the tiles aggregated in ALL rows. If a line of six is either placed or completed, the player doing so scores an extra six points. This is called a Qwirkle. Example: Sarah draws six tiles. She can make a row of four blue, but two of those blue tiles are diamonds. So she can only make a row of three. Sarah scores three points. Jacob has five diamond tiles, in four colors – none of which are blue! So he can lay down the four distinct tiles perpendicular to Sarah’s row, meeting at the blue diamond that she laid down on her turn. Jacob scores five points. Mariam has the last available color for the row of diamonds, and can create a new, perpendicular row of three, expanding down from the end of the row of diamonds – she has finished the row of six, which scores her a Qwirkle (an extra six points) as well as creating a new row of three, for a total of fifteen points. After placing tiles, each player draws tiles from the bag until they have six, and play continues. The game ends when the bag is empty and one player has placed all their tiles. The first to do so gains an extra six points. That row of six, finished by Mariam, is now complete. Rows can be built perpendicular to it, but no tiles can be added on the end. This provides a chance for some interesting strategies in blocking your opponents and setting up future Qwirkles. On Tuesday night, we pulled it out and played a not-so-quick game. 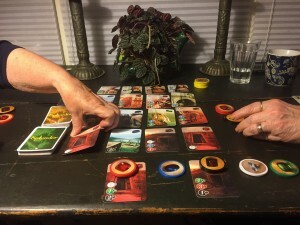 With two experienced players and one new player, it became an exercise in pointing out possible strategies and looking at the board in a different way. The photo above was our final layout: this is why we have oversized tables! The replayability on this game is very high. It’s absolutely a modern classic, and great for families as well as small groups. Happy gaming! Welcome to House Rules Cafe! Over the next couple weeks, we’ll be introducing our staff, the cafe, and our philosophies. We’ll show off the space, and talk about some of our games. For some of our informal, frequent postings about life in the cafe, check out our Facebook Page, Twitter, and Instagram. We’ve started take-out, and are working on getting the bagels in stock. But we are here every morning from 7-9am (8-10am on Sunday) for all your caffeine needs!